In the paleo world, nightshades are discussed frequently not only because of their relatively recent entrance into our food history (can they even be considered paleo? ), but also because of their effect on autoimmune disease. The first argument, in my estimation, is silly. I mean, how many of the other foods we consume are legitimately from the Paleolithic Era? The answer is: not many. Chicken… Nope. Coffee…Nope. HoneyCrisp Apples… nope. Seems like a lame excuse to cut healthful plant foods out of the diet. On the other hand, if you or someone you know is struggling with an autoimmune condition, symptoms seem to decrease with the removal of these nightshade vegetables. Don’t ask me why, because I can’t explain the science. What I can say is that I’m staring down the barrel of an Autoimmune Paleo Diet right this second. Yep, looks like I may have to go all the way to calm my incessantly tempermental digestive system. All that to say I probably won’t be eating this meal anytime soon. People seem to love it though! 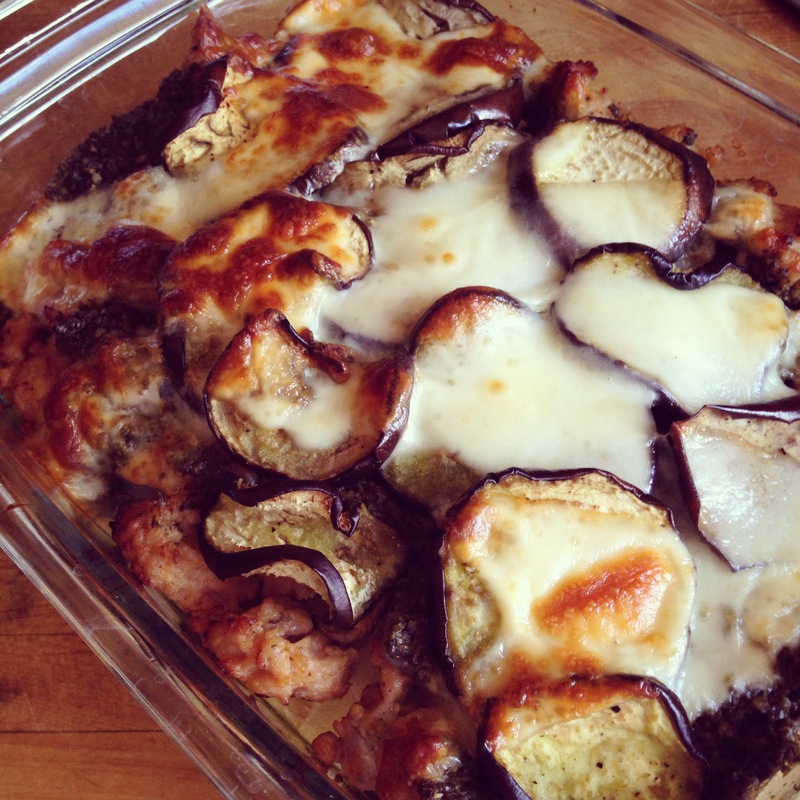 Lay zucchini and eggplant slices on a baking sheet and bake for 8-12 mins until tender. In a skillet, saute mushrooms, onions, and sausage until sausage is cooked through and onions are somewhat caramelized. 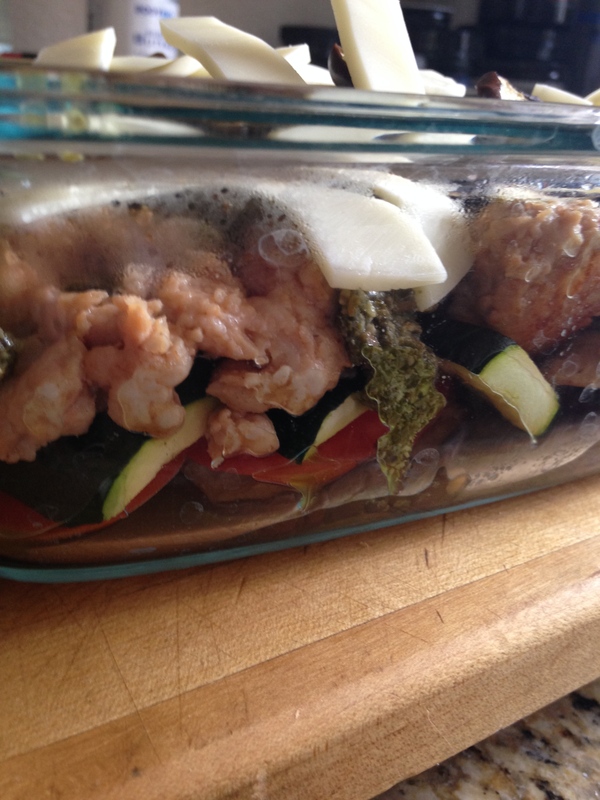 In a baking dish layer eggplant, then zucchini, then sausage mixture. Add your preferred sauce and then add any remaining layers of vegetables and more sauce if leftover. Place dish in the oven and bake until cheese is golden and sauce is fragrant. Options: add olives, fresh tomatoes, roasted garlic, pepperoni instead of sausage, any other of your favorite pizza toppings. Can also be made vegetarian by omitting the meat option and just using veggies! Portobello mushrooms would be great!